Chicago home care worker Gilda Brown became a part of home care history when she stood by President Obama in Washington, DC as he announced a major victory for home care workers. The US Department of Labor is moving forward to amend regulations under the Fair Labor Standards Act [FLSA] to include the nearly two million home care workers who had been excluded from federal overtime and minimum wage protections. 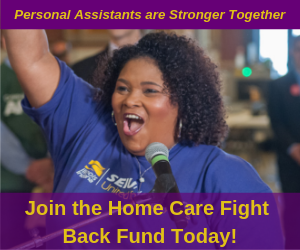 This long-overdue change not only guarantees the same rights and protections for home care workers as other workers have enjoyed for decades, but continues to reinforce the fact that home care is real, important work that our nation depends on. 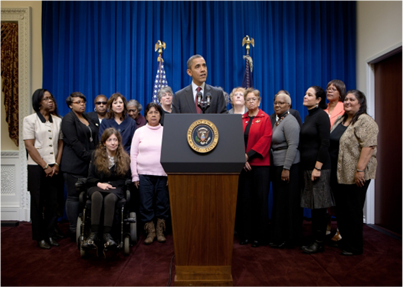 Gilda Brown, far left, stands with President Obama and other home care workers and consumers as he announces new overtime and minimum wage protections for home care workers. “It was so exciting to be there with the President, to be part of something so historic,” said Gilda. Gilda worked on Obama’s 2008 campaign, but hadn’t gotten to meet him face-to-face until her recent trip to the nation’s capitol. “Before he made the announcement, he told us that even though some people don’t take this work seriously, he knows how important home care is. He told his staff that this change was past overdue and that nobody could go on vacation until they got it done and signed,” Gilda said. Before this announcement, President Obama walked a day in another home care provider’s shoes, to gain an understanding of just how important home care is to working families across America. “Now more than ever, every job in our country must be a good job that can sustain a family, strengthen our communities and move our country forward. Very soon, every caregiver in America will be equal in the eyes of the law and equally protected,” said SEIU President Mary Kay Henry in response to this victory. See the video of President Obama’s announcement. As the legislative session heats up and the city of Indianapolis prepares for this year’s Super Bowl, Indiana Republicans are fighting to punch through so-called “right-to-work” legislation that would limit collective bargaining for workers as fast as they can. But Indiana Democrats and SEIU members are working just as hard to stop this anti-worker, pro-corporate legislation, and to educate the public about the harm right-to-work laws have caused in other states. Yesterday, members from all over the state traveled to the Capitol to fight against legislation that puts corporate greed ahead of Indiana families. Members came to the Capitol from all over Indiana to stand up for working families. There is no solid evidence that right-to-work states attract businesses more than states without these laws: according to the Economic Policy Institute, “the evidence is overwhelming that right-to-work laws have not succeeded in boosting employment growth in the states that have adopted them.” However, studies conducted by the US Department of Labor, the US Census Bureau, and others have found that workers’ quality of life decreases with the passage of right-to-work laws. For example, Indiana workers currently earn a higher wage on average than workers in right-to-work states, and are more likely to have job-based health insurance and pensions. As Indiana Democrats continue to fight to defeat this harmful legislation, our members will keep holding Republican lawmakers accountable to their constituents—not greedy corporations. “We’ll stick together and keep fighting until we get our point across,” said Kelley. 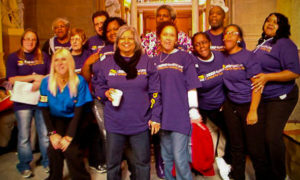 Our members will head back to the Statehouse to keep working for the rights of working people on January 24th.